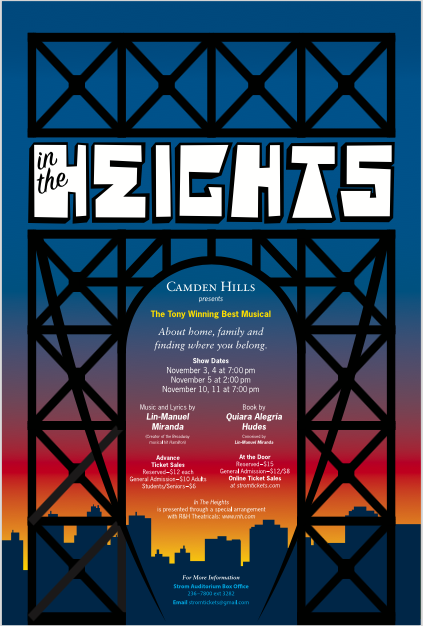 In the Heights, the Camden Hills Regional High School fall musical, brings the vibrant community of a New York City barrio, where “Everybody’s got a job, everybody’s got a dream,” to the stage of the Strom Auditorium, this November. The upbeat Tony Award winning musical production, created by Lin-Manual Miranda of Hamilton fame, will be presented Fridays and Saturdays, Nov. 3, 4, 10 and 11 at 7 p.m.; and Sunday, Nov.5, at 2 p.m.
Advance ticket sales for In the Heights are $12 for reserved (front section) seats and $10/$6 students and senior citizens for general admission. At-the-door prices increase to $15/$12/$8. Tickets can be purchased in advance online at stromtickets.com or reserved by calling 236-7800, ext. 3282. Email stromtickets@gmail.com for ticket orders and more information. The CHRHS Strom Auditorium is located on Route 90 in Rockport. Through melodic songs, original rap lyrics, humor, and the driving rhythms of hip-hop and Latin music, In the Heights tells the story of a group of friends and neighbors, who share hopes and struggles, find romance, and dream of escape to a better place. Streetwise hipsters, big sound and high-energy choreography are bought to the stage by the singing and dancing ensemble. While Usnavi raps, he introduces the neighbors who stop by for their morning coffee, lottery tickets, candy, newspapers and, of course, gossip. That morning, Nina Rosario (Annabel Parker) arrives home for the summer, planning to drop out of college after her first year at an Ivy League school. When neighborhood matriarch Abuela Claudia (Sydney Lytton), greets Nina as the future mayor of ‘Nueva York,’ Nina reveals that her year away from home was a failure. The kid couldn’t hack it, she’s back and she’s walkin’ real slow. As the young friends look forward to a party with fireworks, romance and its complications take center stage. Childhood friends, Benny and Nina, fall in love. Nina struggles to see a future after losing her college scholarship, while Benny faces her parents’ disapproval of their relationship. Meanwhile, Usnavi who hesitates to show his feelings for Vanessa, gets a push from his cousin and employee Sonny (Ruben Feldman) in Vanessa’s direction. The Rosarios struggle with financial problems, and Abuela shares a secret with Usnavi, that could change his life. A power outage, a winning lottery ticket, and the loss of a beloved friend lead Usnavi, Nina, Vanessa, and Benny to discoveries about each other, themselves, and the place they call home. In the Heights is presented by CHRHS in special arrangement with R & H Theatricals. Miranda began work on In the Heights while a sophomore in college. A decade later, it became his first Broadway hit, earning four Tony Awards including Best Musical in 2008. He went on to create the Broadway sensation, Hamilton: An American Musical, which premiered in 2015. Miranda was born in Washington Heights, in New York City, where immigrants from the Puerto Rico, Dominican Republic and Central America made their home. A common theme of immigrants struggling to find a better life, appears in both In The Heights and Hamilton. A fundraiser for Puerto Rican Hurricane Relief will be held during all five performances. In September, the island of Puerto Rico suffered devastation during Hurricane Maria. 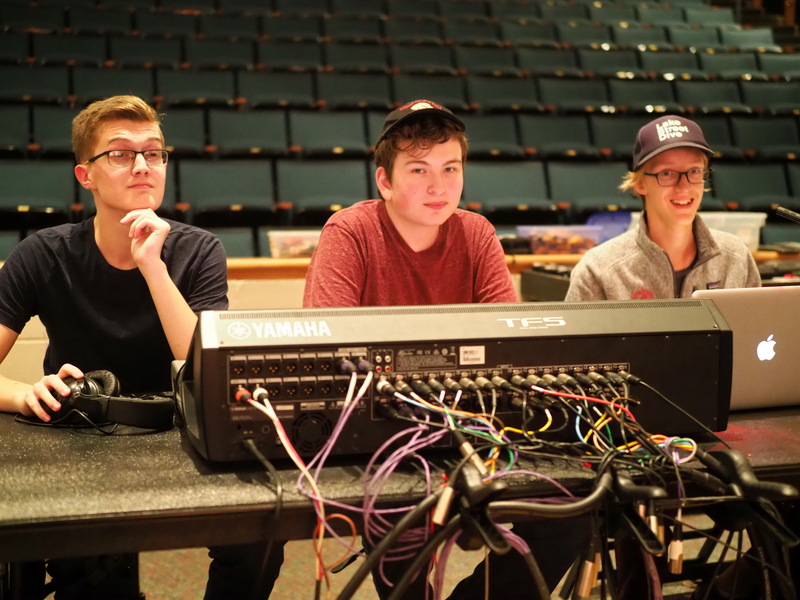 Around the same time, CHRHS students were rehearsing the musical number “Blackout,” which closes Act 1, in which the barrio is plunged into darkness, due to a massive power outage. The poignancy of singing the words “blackout” and “we are powerless” while rehearsing In the Heights was not lost on Musical Director Kim Murphy. The local fundraiser was inspired by Miranda’s “Almost Like Praying,” a single he recorded with other Latino artists to assist with disaster relief in Puerto Rico. Like Miranda’s fundraising single, proceeds of the fundraising during the fall musical will be donated to the Hispanic Federation’s disaster relief fund. You are currently browsing the me arts ed blog archives for the day Saturday, October 28th, 2017.